Although fallen into relative disuse after the Second Vatican Council, the Anima Christi prayer is rich in devotional allusions to the wounds of Our Blessed Savior and the mysteries of the Holy Eucharist. It is worthy of frequent recitation by all who aspire to union with Christ and who wish to make reparation for outrages, sacrileges and negligence toward the Blessed Sacrament, especially as we approach the traditional Feast of the Most Precious Blood of Jesus on July 1. The Anima Christi is believed to have been composed in the early fourteenth century AD. It is included at the beginning of the Spiritual Exercises of St. Ignatius of Loyola, founder of the Society of Jesus. 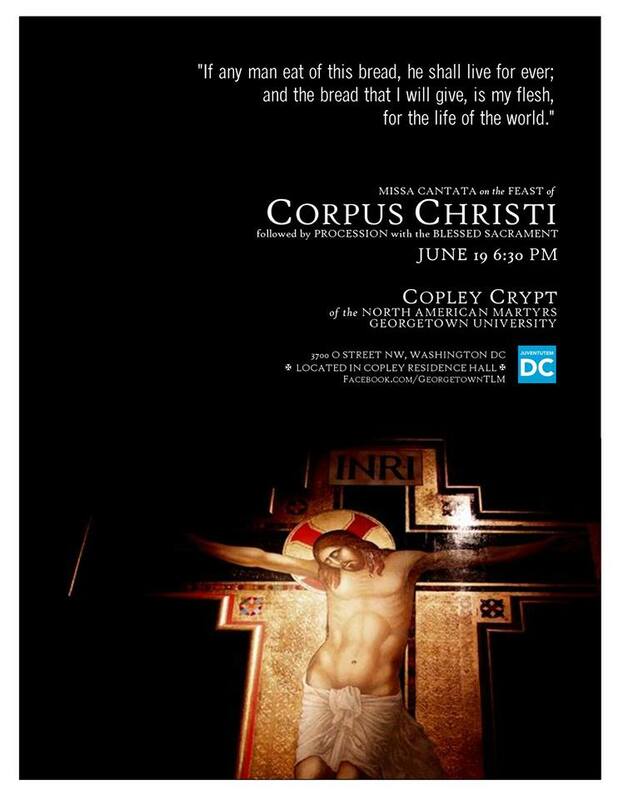 The Georgetown Traditional Latin Mass (Extraordinary Form) Community announces that a Missa Cantata will be offered Thursday, June 27, at 6:30 p.m. in Copley Crypt Chapel at Georgetown University. Father Stephen Fields, S.J., will be the celebrant of the Mass of the Feast of the Sacred Heart. Copley Crypt is located in the rear of Copley Hall, directly north of Healy Hall on the main campus of Georgetown University, 3700 O Street NW, Washington. On Wednesday morning, June 25, Low Mass of the Feast of St. William of Vercelli will be offered at 7:00 am. On Friday evening, June 27, Sung Mass of the Feast of the Sacred Heart of Jesus will be offered at 7:30 pm. On Saturday morning, June 28, Low Mass of the Vigil of Ss. Peter and Paul will be offered at 7:00 am. Often, men and women who have discerned a religious or priestly calling are impaired from pursuing their vocation by large amounts of outstanding student loans, whose settlement normally must be arranged prior to entering the novitiate or seminary. The Mater Ecclesiae Fund seeks to remove these impairments by paying candidates’ student loan installments while candidates pursue their vocations. At present, more than 100 men and women are being helped by the Mater Ecclesiae Fund to follow their vocations. The fund has assisted a number of newly ordained priests, including Fr. Daniel Heenan who was ordained last Saturday in Leesburg as a priest of the Priestly Fraternity of St. Peter. Contributions to the Mater Ecclesiae Fund are tax-deductible and may be made year-round. While the 2014 grant application cycle has completed, the 2015 application cycle is expected to open on September 15, 2014. Monsignor Thomas Olszyk, Judicial Vicar of the Archdiocese of the Military Services, will celebrate Mass of the Second Sunday after Pentecost on June 22, at the Traditional Latin Mass Congregation of Silver Spring, Maryland. As announced previously, Sunday’s will be the last TLM that Msgr. Olszyk will offer in Silver Spring before he moves away from Washington, D.C. The Traditional Latin Mass (Extraordinary Form) will be offered on Saturday morning, June 21, at St. Michael Church, 7401 St. Michael’s Lane, Annandale, by parochial vicar Rev. Fr. Richard Carr. Low Mass of the Feast of St. Aloysius Gonzaga, Confessor, will begin at 10:00 am. Rev. Fr. Daniel Heenan and Rev. Fr. Zachary Akers, who were ordained on Saturday at St. John the Apostle Church in Leesburg by Bishop James Conley of the Diocese of Lincoln as priests of the Priestly Fraternity of St. Peter, will each be celebrating several First Masses as prescribed in the Rite of Ordination. Monday, June 16, 7:30 pm, St. John the Baptist Church, Front Royal, Va.
Thursday, June 19, 6:00 pm, Our Lady of Hope Church, Potomac Falls, Va.
Sunday, June 22, 11:00 am, St. Joseph Church, Richmond, Va.
Msgr. Olszyk to offer 2 final TLMs at Silver Spring before leaving D.C.
Monsignor Thomas Olszyk, Judicial Vicar of the Archdiocese of the Military Services, will soon retire from the military tribunal and move away from Washington, D.C.
Before his departure, Msgr. Olszyk will celebrate two Masses at the Traditional Latin Mass Congregation of Silver Spring, Maryland. On Sunday, June 15, the Low Mass of Trinity Sunday is scheduled, while a Missa Cantata of the Second Sunday after Pentecost is scheduled to be offered on Sunday, June 22. On both Sundays, Holy Mass will begin at 8:00 am, and Confessions will be heard from 7:30 to 7:55 am.